Contemporary decor and modern facilities ensures a comfortable homely experience in this immaculate apartment. One bedroom has 2 twin beds, the other a king size bed and a sofa bed in the lounge. Designed for singles, couples, families or guests on business trips. Everything needed for a comfortable stay. 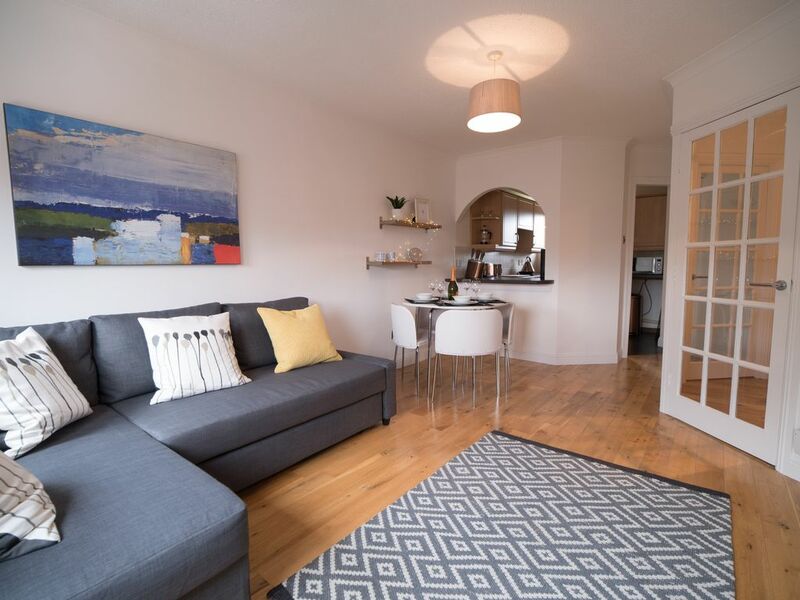 Perfectly located for visiting local attractions including The Kelpies, Falkirk Wheel and Callander House as well as 30 minutes to Edinburgh, Glasgow and Stirling. Private parking on site. The apartment is situated in a small attractive block of flats in a quiet area with private parking and close to local amenities. Guests remark at the apartment being spotlessly clean. The lounge/dining area features home entertainment by Wi-Fi, Netflix, and a large screen smart TV. In addition the apartment offers a small collection of books and information brochures about the area and its activities. There is a fully equipped kitchen with washing machine/drier, fridge freezer, oven and hob, toaster, kettle, micro wave and coffee machine. The private bathroom contains a shower, bath, soaps and shampoos. All towels and bed linen are provided as are ironing facilities and a hairdryer. Guests also love the location. It's only a minutes walk from the apartment to a range of services including a general store, mini super market, post office, pharmacist, butchers, hairdressers, restaurants, fast food outlets and a couple of pubs. Only 5 minutes drive to all of the services you would expect of a large town, in Falkirk town centre. Perfect location to motorway network. Only a few minutes drive. Access to cities of Edinburgh, Glasgow and Stirling by motorway or train in only 30 minutes from Falkirk. Ideal base to visit local attractions. Only a few minutes walk to the historic Callendar House, Callendar Park and the Roman Antonine Wall. A few minutes drive to the world famous magnificent Kelpies, The Falkirk Wheel, the canal network, John Muir Way and Canada Woods cycling routes. And much much more. There is a private parking place to the rear of the building along with ample free on street parking and a small free car park across the road. Interaction with guests Check-in is from 15:00 on date of arrival. Check-out is 11:00 on departure date. Access to the apartment can be gained by entering a pin code into the lock box located at left hand side of the front door. Maintenance and assistance can be called upon at any time by our guests. Always pleased to help in any way. Designated car parking space in the back court (number 6 on the wall). Also, free public car park immediately across the road and a layby at the side of the block of apartments. Free Wi-Fi access. Code available in the Folder. Living room seats up to 4 adults. Dining table and chairs also cater for up to 4 adults.